A person claiming himself as the bank manager called Surabhi Mahajan who lives in Ahmedabad and asked for her debit card details for 'security check'. Surabhi initially was wary of divulging secrets as she never received any such call before. But, when the person said that the card would be blocked if she doesn't co-operate with him she gave out the PIN number. Next day she visited the bank and upon enquiring she came to know that no such call has been made on behalf of the bank. In fact, bank manager clearly said that bank official never ask for such details and that too over phone. Her doubts and feat intensified and hurriedly Surabhi checked her account only to find that all her hard-money had gone. Surabhi Mahajan is not the only victim of debit card fraudulent activities that have been mushrooming across the country for a past few years. However, the pattern keeps changing. Sometime the victims get to know about the fraud through the SMS alert that money has been withdrawn from their accounts. In most cases, the culprit remains untouched and the lost money is seldom retrieved. However, these isolated events are nothing compare to the magnitude of the recent debit card fraud. Details of a whopping 32 Lakh debit card are reported to be compromised in this recent debit card fraud. A breach of Malware in the payment systems of Hitachi is said to be the reason of the biggest financial fraud ever took place in India. It should be noted that most Points of Sale and ATMs in India are powered by Hitachi. Among them, the worst victims are the leading banks like ICICI, HDFC, YES Bank, Axis Bank and SBI. To keep the situation under control, different banks have come up with different solutions. SBI has already blocked six lakh debit cards and will reissue 60,000 of the, To ensure safety, SBI has laso advised its customers to change the PIN of the ATM cards. Other banking organizations like ICICI Bank and Yes Bank also asked their customers to have their ATM pin numbers changed. Axis Bank and HDFC Bank also issued statements to use only their ATMs to carry out transactions. Just a Tip of the Iceberg? Although, the breach of ATM card data took the whole country by storm it is just a tiny illustration of a global criminal activity called cyber crime. With each passing year of technological advancement, cyber crime has been gaining impetus. Aside from fraud calls, breach of data is now taking place through various ways such as password theft, hack, cyber stalking and by using malicious software. Is Future of Online Banking and Shopping at Stake? At present, most of us prefer online banking and shopping to save time and for the ease it offers. Online shopping in particular, has gained a lot of momentum over the last decade and a large number of e-commerce portals and apps have come into existence to tap into this increasingly popular way of buying products and services by paying online using various payment gateways and credit and debit cards. However, all apps and portals are not equal in terms of security. But, if you know how to deal with such fraudulent activities you can easily safeguard your financial well-being. What Makes Websites and Apps Secured? The URL of secured websites start with HTTPS. HTTP stands for Hyper Text Transfer Protocol and the S stands for Secure. And there is also a padlock sign on the left side of the URL. You can make payments on these portal without worries. However, the portals with only HTTP are not secured and it is not advisable to carry out financial transactions on these websites. Websites that use HTTPS are reliable as they use SSL encryption to ensure that any information which is provided online in the likes of your banking details are completely safe. SSL marks the standard of security and websites use it so that their customers can transact online safely. It helps establish the trust of the customers. Mobile apps that you can download from trusted sources such as Android, Google or Apple App stores are considered as authentic. With the flourish in online shopping in India, buying insurance online has also become popular. If you want to buy insurance online in India, GIBL is your one-stop destination. Both the portal and app of GIBL, the premiere online insurance marketplace is completely safe and secured for online transaction. Here are the five reasons why you can buy online insurance from GIBL portal or mobile app and pay online safely. The URL of the GIBL.IN website comes with HTTPS along with a padlock sign to ensure complete safety. 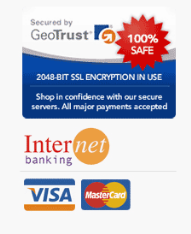 The entire portal of GIBL.IN is encrypted through SSL certification. Like all reputable companies, GIBL also boasts a brick and mortar outlet and an email id and phone number so that customers can get in touch in case they face any trouble or have any query. Furthermore, various social networking sites such as Facebook, Linkedin and Twitter are also integrated with the portal of GIBL.IN as the portal boasts presence in all these social media. There is also a Google Map to help users locate the corporate office at ease. Portals that accept Credit cards are more likely to be genuine because they sought application from top companies that issue credit cards to get approval. Moreover, credit cards offer better protection that debit cards. GIBL accepts a range of credit cards and thus ensures its legitimacy. The entire portal of GIBL.IN site is encrypted by SSL Certification for complete safety. Encryption helps keep crooks away from your financial information and allows for secured online transaction. Yet another financial data heist cannot stall the online shopping spree as long as consumers remain cautious and apply safety measures to ensure that they deal with only trusted online resources. GIBL.IN is a complete safe online insurance marketplace where you can compare, buy and renew online insurance and make the payment using secured payment gateways.